IN THE STORY OF THIS HISTORIC HOME. The year is 1905. Echuca is a bustling port town. Pounds upon pounds of new money flow into the area just as quickly as wool, wheat and timber can be offloaded from the mighty paddle boats and onto steaming trains and the drays of braying horses; ready to be sent off to the city. Impressive new homes of magnificent scale and elegant proportions are being built across Echuca in the picturesque Queen Anne style, a symbol of this new-found wealth and prosperity; inspired by the optimism of a newly federated Australia. On a gentle rise, just to the east of the town, the owner of a nearby sawmill builds such a home for his family. It’s here the story of this grand old home begins. Our homes are filled with stories. In older homes, you might not know the whole story, the pages yellowing and fading with time. But they’re still there. There’s the window, bathed in the most beautiful morning light, where an old lady used to sit and read. There’s the dent in the architrave where a new dining table was unceremoniously christened as it was moved in. There’s the toy soldiers, imprisoned in a wall cavity behind plaster and several coats of forgotten colour, dropped through a hole in the wall by a mischievous young boy. Importantly, our homes can’t be just other families’ stories. They need to tell ours, too. At Mitchell Street, the latest story is that of a young family, the Normans: Gary, Lara and their daughters Hannah and Georgia. The Normans adore the history and character of their old home, and want to respect its legacy, but they need it to work with their lifestyles and reflect their tastes. 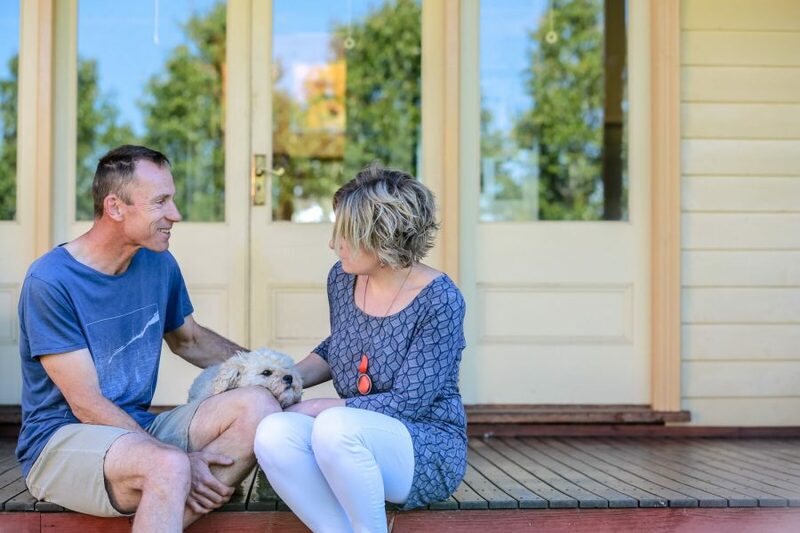 Gary, Lara and the kids lived in the home for several years before deciding to renovate, giving them a sense of what worked and what didn’t work. Ultimately, the need for extra space meant it was time for an addition. Business owners who work from a home office, they wanted to free up the third bedroom for their growing daughter, Hannah, who needed her own privacy. That’s where we come in. As designers, it’s our job to help our clients write their next chapter, ensuring their home functions for modern family life, without whitewashing or bastardising the history they love. It’s our role to think creatively, test ideas and help to move our clients out of their comfort zone (just a little!) if necessary, so they can achieve the best possible outcome for their needs and budget. In many ways, this home was perfect in its layout, with a generous central hall flowing into spacious bedrooms and a grand lounge. Of course, this made designing an addition all the more difficult. You never want to come in and fix what isn’t broken! While the home was renovated and polished by previous owners to enclose the rear porch and transform it into an open-plan kitchen, dining, and family room, it was still in its original condition with all of its original features intact. The easy solution is to tack on an extension out the back. While this was certainly considered as an option, we could see this was not what the Normans wanted, nor needed, and we felt this approach would disrespect the heritage and history of the home, a jarring new chapter, written in a completely different language. We helped the Normans navigate the complexities and bureaucracy around altering their heritage-listed home and ultimately arrived at a solution which exceeds their expectations and feels at one with the original home. Working with the geometry of the existing verandah, we have created a new study and utility room that fits neatly under the roofline and connects to the living area via wide double doors. An internal raked ceiling maximises the ceiling height to ensure it feels light and airy. A window looks out over the backyard, where a new pool creates a relaxing vista to enjoy while working in the study. That simplicity is not easy to achieve, as the builder would attest as he scratches his head trying to work out how to tuck this precise addition under the original roofline. Ultimately though, this attention to detail, minimal intrusion and the illusion of simplicity is worth it. The new study feels like it’s always been a part of this home, with a friend commenting, ‘I’ve never been into that room…’ not realising it’s a completely new space! Finally, a new interior colour palette softens the previous bold colours and now acts as the perfect backdrop for the family’s vibrant artwork and furnishings. Repainting also gave the girls the opportunity to personalise their rooms, stamping the home with their own mark. As Gary, Lara, Hannah and Georgia continue to write the story of their home, and continue its grand legacy. We’re excited about the future of this beautiful old home and hope that our contribution will have a positive impact on this space, on the Normans and the way they live. Long may this story continue.